Conventional real estate wisdom has it that most home purchases require a down payment of a least 20 percent of the purchase price. That’s a number that may be keeping some potential homebuyers out of the market while they scrape together the required amount. What’s more, in this period –soon to change – of unprecedented low interest rates, saving up for a 20 percent down may actually end up costing more in the long run. It seems simple: the more a prospective buyer can put down, the lower their payments over time, and the better the financing terms. But according to new infographic produced by LendingTree, the average down payment has dropped by 9.4 percent over the past two years – and the average down payment nationwide is hovering at 16 percent, with some borrowers securing a home with ten percent down or even less. Those lower down payments open the housing market to more potential buyers, say industry watchers. While buyers with lower incomes and more credit concerns struggle to save up that 20 percent, they’re missing out on the current low interest rates and lower cost homes. By the time they do have that down payment, say financial experts, interest rates will be higher and so will home prices – and 20 percent won’t have the same value. Though they’re inching upward, current interest rates remain very low, propped up by the Fed.’s buyup of billions in mortgage-backed securities. But the Fed has just announced plans to wind down is artificial manipulation of the marketplace by mid 2014, which means rates will actually reflect the market. According to a recent Yahoo Homes post, that means that a mortgage secured today at 4 percent with a 10 percent down payment will cost less over the life of the loan than the same mortgage at 20 percent down in a year or so, when rates could be at 7 percent or more, and home prices will have risen, too. Lending standards are tighter now than in the years around the housing collapse of 2008, and the Qualified Mortgage Rule soon to take effect establishes some specific criteria for ensuring that mortgage holders can actually carry the arrangement. But, say housing industry experts, that doesn’t mean lenders eager to close a mortgage deal won’t finance a home with a down payment of less than that magic number of 20 percent. Karmon, Jennifer. 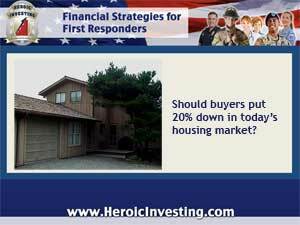 “Who Puts 20% Down on a House? Not Nearly as Many as You Might Think.” Yahoo Homes. Yahoo.com. 21 Jun 2013.